"very rare 1969 Fender Jazz Bass. You're thinking "Sherwood Green"? When the original owner 1st walked in with it I thought it was Sherwood and almost passed out....after a long glass of "Crown Royal" (Gods' nector for a recovering alchoholic) I found it to be a very cool faded Lake Placid Blue custom color WITH MATCHING HEADSTOCK YOU PILGRIM! A.J. 's Factoid: The most sought after of all Jazz Basses is a 69 in Lake Placid!!! It is a rare lacquer finished bass. Sunburst finished basses in '69 had the tone smothering goopy polyurethane finish. Look at the pictures under the pickguard and the Lake Placid blue is very vivid." 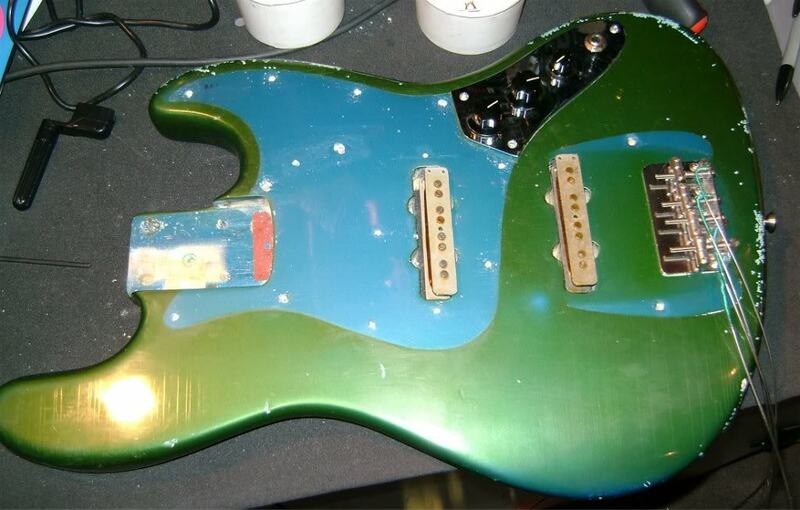 have a '68 Jazz Bass in the exact same color (Lake Placid Blue) with Head and Body lacquer faded to green. It was appraised at $7000 in 2012.